Any well-built structure begins with a strong foundation. A foundation is the underlying base, the support, or the ground upon which something is built. When people ask us what the Camp Echo Lake values are or what Dedicated to Human Development means, we look to our Camp Echo Lake Foundations as the guidepost for who we are and the measuring stick for every decision we make. CEL’s Foundations: Safety, Connection, Empathy, Discovery, Effort, and Resilience are at the heart of our Warm Inner Glow. These six CEL Foundations are central to our Dedicated to Human Development goals. They are incorporated into our staff recruiting, training, and evaluation process. We believe that if a camper or staff person is going to have a complete and growth-filled experience at camp, he or she is experiencing Safety, Connection, Empathy, Discovery, Effort, and Resilience as a member of our community. We wanted to take the opportunity to now introduce our campers, parents, and camp community to the CEL Foundations, a tangible representation of who we are and what we do at Camp Echo Lake. As Echo Lakers we prioritize physical, emotional, social, and psychological safety in everything we do and in every interaction, we have. Why? You can’t have development without safety. Personal growth and development happens in an environment in which an individual feels safe. As Echo Lakers we believe in creating meaningful relationships, valuing each person in the community, respecting the individual, and including everyone in the group. Why? Human connection is the basis of a strong community. The ability to connect with others provides fuel for personal growth. As Echo Lakers we acknowledge and relate to the feelings of others and operate under the understanding that our actions and words impact others. Why? Relating to the feelings of others – and having people around you who relate to yours – creates a sense of community spirit and love. As Echo Lakers we try new things, build new friendships, and continue to learn new skills in order to grow and evolve. Why? Healthy risk-taking and stepping outside of where you are comfortable allows you to go farther than you thought you could. As Echo Lakers we learn from mistakes, setbacks, and failures and keep going even when things are tough. Why? Overcoming challenges develops your strength, independence and confidence and teaches that imperfection is opportunity for growth. For Campers, Staff, and our camp community, our CEL Foundations underscore the experiences, growth, and fun that can be expected from a summer at Camp Echo Lake. 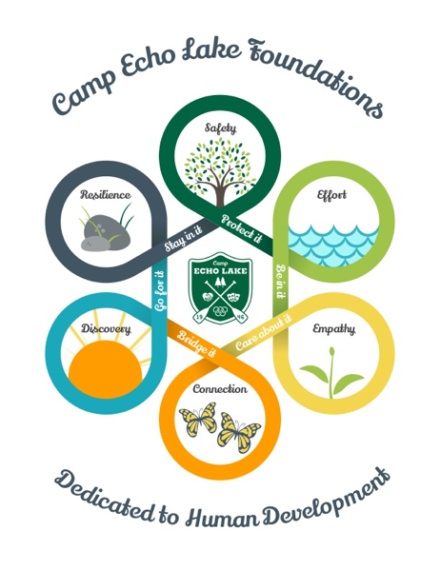 Our Dedication to Human Development through the actions and ideals of our Camp Echo Lake Foundations make up what you can expect from Camp Echo Lake. Over the next six weeks we will focus each of our weekly CEL Blog posts on one of our CEL Foundations. Each post will highlight one of our six CEL Foundations and illustrate what they may look like, and what they mean, at camp. We want to hear from you too! If you have stories of when you or someone you know experienced or exemplified one of the CEL Foundations, please send it our way and you may be featured in one of our future CEL Blog posts! We look forward to sharing future CEL Foundation blogs and experiences with you and are counting the days until our CEL Community can embody our CEL Foundations all summer long.